Last Thursday Southern Housing Group (SHG), a charity, gave a public presentation to the local community of its scheme for a second towerblock at London Fields, eastside. 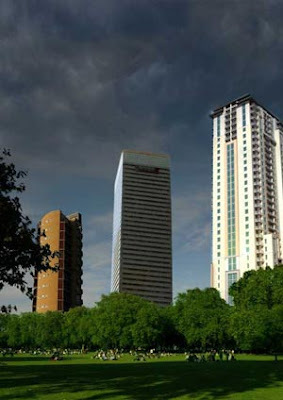 SHG said it had considered feedback from meetings with Hackney Council and Boris's GLA planners when designing the "slender" 19 storey tower development of 78 very high density flats, houses and commercial units. 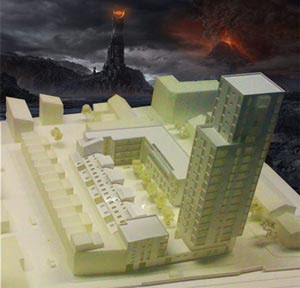 It was claimed that, compared with the existing site at 22-24 London Lane, the design and scale of the development would "enhance" the surrounding low rise buildings of the Mare Street Conservation Area. Admittedly it is not in a designated Tall Building Opportunity Area - but the professional view was that at street level people apparently don't notice towers (Don't look up!). SHG said it wants "a scheme everyone is happy with" but members of the public voiced passionate objections to the development for a whole range of reasons. Perhaps people fear yet another charitable developer is seeking to exploit the London Fields location to the comunities disadvantage. Will SHG redesign its scheme to meet local objections or just plough on regardless? If you can offer support or skills to help the the local community in London fields then you can find "No Hackney High-Rise" contact details here. PS The meeting was held in Free Form Arts' Hothouse, an award winning development on London Fields east. Superbly designed and finished. A low-rise building delivering community benefits. I like it! Very NYC. So, Michelle, why dont you move to NYC. Or Dubai. Or Croydon. I second that, in fact take your friends that also like this with you. Infact Hackney Council have 4 towers planned and none at all are inviting, if we take a look back at the history of tower blocks they come in two categories; 1) ultra expensive, which will attract the west-enders and 2) well we all know the problem related there. awesome, this is going to be soo cool ya! Beside areas of open space is where tall buildings should go so that people within them have adequate open space. Building tall is one of the only ways for London to stop growing out and swallowing the countryside. Do you think these 'charitable' developers are doing this to make a buck? Or to to house the thousands of people who need homes in Hackney. Let's get over the nimbyism and concentrate on making sure that if we have to have tall buildings they look fantastic and make a positive contribution to our area. Actually, David, given the small fortune it paid for the site the developer has to max the development to make the bucks to pay for a reckless decision. Nothing to do with charity now - although, for sure, the previous owner must be very grateful.